making miso A clay pot, dated to the mid Jomon period (10,000 to 400 B.C. ), was found in Hokuo, Yamanashi Prefecture with Japan’s oldest species of cultivated soybean imbedded in it. The finding, announced in 2007 by officials at the Yamanashi Prefecture Museum of Art, suggest that soybeans have been cultivated for more than 5,000 years, making it one of the world’s first cultivated foods. The Japanese consume more than 20 kilograms of soy beans per person a year. Soy beans are used to make tofu, miso, natto and other staples of the Japanese diet. About 80 percent of the soy beans consumed in Japan are imported, mostly from the United States, Canada, Brazil and Australia. Imported beans cost around ¥4,000 for 60 kilograms, compared to ¥9,000 to ¥15,000 for domestically-grown beans. .
Good Websites and Sources: Soy Products on the Cook’s Thesaurus sonic.net/~alden/Soyprod ; Wikipedia article on Natto Wikipedia ; Miso Online miso.or.jp ; Miso Soup ajinomoto.com ;YouTube Video of Tofu Making YouTube ; Wikipedia article on Tofu Wikipedia ; Noda (20 miles north of Tokyo) is regarded as the soy sauce capital of Japan. The main Kikkoman factory is here. Soybeans come from wild soybeans, ground-dwelling vines that are found in northeastern China and very different from modern, commercial soy bean plants. The black and brown beans from these wild plants were collected by prehistoric Chinese at least by 3500 B.C., first cultivated by Chinese farmers about 1000 B.C., and fashioned into tofu about a 1000 years later. Soy beans were not known by Europeans until a German physician in Japan wrote about them in 1690. They remained largely unknown in the West until 1900.
soy milk bath Viewed as nutritional savior for the world, soybeans are rich in protein, calcium and B vitamins; high in mono-saturated (good) fat; and contains many photo chemicals, which scientist are starting to believe may help combat a wide variety of diseases. Because they have no starch soybeans are an important part of a diabetics diet and have more protein than lean beef. In places with little meat they are often an important source of protein. Products made with soy beans contains weak estrogens (female hormones) called isoflavones which are believed to reduce the likelihood of getting prostrate and breast cancer and reproductive tumors. Chinese woman on high-soy diets have half the incidences of breast cancer as women on low-soy diets. Japanese women who eat soy products throughout their lives have lower rates of breast cancer than those who do not. Japanese women that come down with breast cancer have higher survival rate than Westerners. These studies do not rule out something other than soy causing the benefits. The U.S. Food and Drug Administration declared that soy protein may reduce risks or coronary diseases by lowering blood cholesterol levels A study at the University of Kentucky showed that consuming two servings a day of uncooked soy protein such as that found in tofu, soy milk and soy powder, reduces bad cholesterol intake by around nine percent. Eating soy products increase the activity of lipoprotein receptors in the liver that clear bad cholesterol from the body. Soy products that had been cooked do not provide these same benefits. 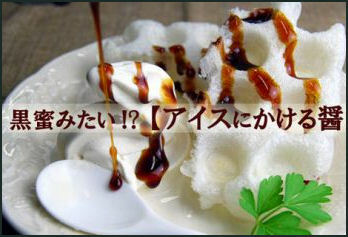 soy sauce dessert topping Tofu, miso and soy sauce are staples of the east Asian diet and are now are very common place in the United States and Europe too. There are also many unconventional uses of soy derivatives. Soil meal is used in making vegeburgers and in brewing beer; tofu is fashioned into ice cream; and soy milk is sweetened and sold as a soft drink in Southeast Asia. soy sauce topping and ice cream Soy sauce is made from soybeans that have been steamed under pressure and mixed with roasted wheat and a ton of rock salt. Malt bacteria or yeast is added to cause fermentation, which lasts for six to ten months, after which time the mash is squeezed and soy sauce is poured out. During the pressing moromi (a mixture of soy beans, koji dry mash and salt water) in cotton bags is pressed to extract the raw soy sauce. The mixture is heated and pasteurized, which stabilizes the color and aroma. The waste is often sold as food to fish farms. Chinese introduced soy-sauce-making methods to Japan in the 13th century. There used to be hundreds of varieties of locally-produced soy sauces but industrialization in the 19th and early 20th century helped homogenize them into factory-produced national brands. The mold used in fermentation is called Aspergillus. It is so revered at the Kikkoman Corporation Soy Sauce Plant, production workers call it "ancestor." 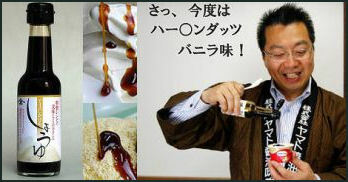 The house of Kadacho, based in the town of Yuasa, produces premium soy sauces that sell for around $14 a liter. Fermented for one and half years, they are is made with pure spring water, no additives and carefully measured amounts of salt, soy beans and wheat. The company insists on using wooden vats and wood fires rather that modern stainless steal vats and gas, the norm in the soy sauce industry. The Kikkoman Corporation is the world's largest soy sauce maker. It has a 27 percent market share in Japan and exports to 90 countries. It has a plant in the Netherlands and two in the United States to meet the growing demand in Europe and North America. Kikkoman also makes a variety of condensed noodle soups and steak sauces. Kikkoman is produced in the town of Noda, which is near Tokyo and is regarded as the soy sauce capital of Japan. Although the ratio of domestic sales to overseas sales is 3:1 Kikkoman’s business abroad is more profitable, accounting of 53 percent , or ¥9.7 billion in operating profits. The company opened up its marketing arm in the United States in 1957 with sales growing steadily there at a clip of five percent a year. The company has been able to grow thanks to efforts to make products palatable to local taste, increased demand for soy sauce as an ingredient for local dishes, and the popularity of Japanese food outside of Japan. The main Kikkoman factory in Noda is here. It covers 92,000 square meters and produces 200 million liters of soy sauce a year (20 percent of the soy sauce used in Japan ). 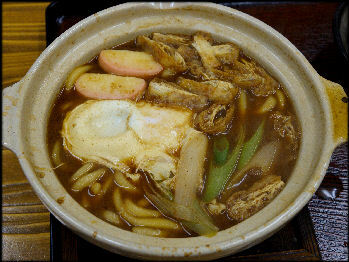 miso udon Miso is a soybean paste made from steamed soy beans harvested late in the autumn and mixed with a fermented grain (usually rice, wheat or barley) and left to ferment in wooden vats for up to two years. It used to make miso soup and is a flavoring for a variety of sauces and dishes. Miso is regarded as healthy. An Edo Period saying goes: “Miso keeps the doctor away.” Through its fermentation protest it becomes rich in soy protein, lactic acid bacterium, vitamins and minerals. Its high salt content however means it should not be consumed in excess. Miso is made from steamed soybeans, rice malt, salt and water. The ingredients are mixed and placed in large barrels, preferably made from cedar trees from Akita Prefecture, that can hold two tons of miso. 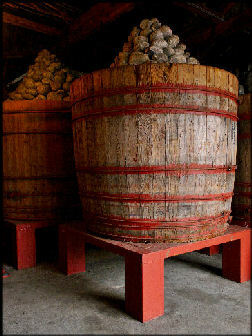 The barrels are then covers and left to stand for six months, with the fermenting periods depending on the variety of miso desired. Fermentation takes longer in the winter but the resulting miso is said to taste better. 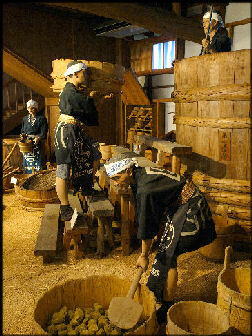 To make rice malt, the surface of rice is covered with koji mold and left for four days. In the old days, people often made their own miso at home. "I don't want to boast about my miso but...." is a standard humble beginning a boast about achievement. Miso soup is consumed by many Japanese during all three meals. Often served in a lacquered bowl with a top that keeps the soup hot, it is used to wash food down like water. The first evidence of miso soup is from the 8th century. By the 12th century it was a fixture of the Japanese diet. Today miso soup is as associated with Japanese mothers as chicken soup is with American mothers. miso finishing barrel There are hundreds of different kinds of miso. A typical large supermarket sells 32 varieties of miso paste. Most are identified by the grain used in the koji (starter mash used in fermentation) and usually defined their color---aka (red) or shiro (white)---and the relative percentage of soy, grain and salt and the length to the aging period. Pale, red and sweet are the most common miso varieties,. Generally the longer miso ferments the darker its color is. “Sweet” miso gets its flavor from high concentration of rice malt. Most major producers of miso use a 1 to 0.6 soybean to rice malt ratio while those who make sweeter versions use a 1 to 1 ratio. Aka miso is usually russet in color and contains around 70 percent soybeans, 30 percent grain and 13 percent salt. Shiro miso is usually light tan in color and contains around 60 percent soybeans, and 10 percent salt. It generally has a lighter, milder flavor. Hatch miso, perhaps the most prized soybean food in Japan, is made from soybean paste fermented for 18 months and then aged in cedar barrels pressed under piles of stone. Mame miso is dark brown and made from 87 percent soybeans and 13 percent salt. It is aged for two years and has a strong, sweet flavor. Saikyo miso is a specialty of Kyoto. It is a white miso, with a sweet taste made with a low salt content and more grain than soybeans. Consumption of soy sauce and miso is declining as customers favor more Western and cooked foods. Soy sauce and miso producers are trying to increase sales by pushing snacks and deserts, including cakes and ice cream, made with soy sauce and miso. Tofu is made from pressed, coagulated soy milk. A staple in Asia along with rice, it is one of the most nutritiously complete foods: rich in protein, loaded with minerals, low in calories, almost devoid of fat or cholesterol and friendly to the environment. The word “tofu” is derived from the Chinese dofu (do for “curdled” and fu for “bean”). Tofu is said to have been invented by a Chinese scholar in 164 B.C. and imported to Japan via Korea about the same time Buddhism was, around A.D. 600. It was mentioned in 1183 in a journal of a priest at Kasuga Taisha shrine in Nara and has long been a food offered at temples and shrines. It was particularly valued as source of protein among Buddhist monks that didn't eat meat. For a long time tofu was eaten mainly by the upper classes and vegetarian monks, in part because pulverizing the dried soy beans by hand was very time consuming and labor intensive. The introduction of the millstone to Japan made pulverizing easier and help bring tofu to the masses. Tofu is also important in Japanese culture. During their training geisha girls learn to eat tofu without touching it to their lacquered lips. In the mame-maki ceremony held in February to welcome spring, packets of sacred soybeans are thrown into the air and scattered around the home to ward off evil spirits. In a ceremony called hari-kuyo broken sewing needles are given a final resting place in tofu-filled pan placed on a Shinto alter. Tofu consumption has dropped from 72 pounds per person in 1967 to 59 pounds in 1999. In the old days many Japanese came out of their houses with bowls and bought tofu from vendors who rode through neighborhoods on their bicycles. Kyoto has generally been regarded as the source of Japan' s best tofu. There are around 10,000 shops in Japan that make fresh tofu every day and deliver it door to door. There used to be more than three times that number but competition from supermarkets has forced many to close. Tofu that is eaten about three hours after it is made is said to tastes the best. It is typically made beginning around 3:00or 4:00am. The process in which it is made involves soaking, grounding, boiling, and straining the beans and curdling, pressing, draining, slicing and packing the tofu. The process begins when soy milk is made from soybeans soaked overnight and then crushed and boiled. Soy milk is collected by adding bittern, nigari (a coagulant salt), or chemical coagulant such as magnesium chloride or calcium sulfate, and then extracted it by pouring the mixture through a cheese cloth. The coagulated milk becomes tofu when it is pressed by weights. The bittern is added around 7:00am. It is the residue produced when salt is removed from seawater. Liquid bittern, nigari in Japanese, is scooped with a ladle, and raised over and poured into the soy milk and the soy milk is stirred with a large paddle. This step causes a split-second reaction and is critical to making good tofu. Tofu is made from 80 percent water. Good water and quality soybeans are regarded as the most essential ingredient. Beans picked in late autumn when they become black are considered the best. The time spent on the stalk the more richer the flavor. Green summer beans become edamame. Tofu made with chemical coagulants is softer and smother but tofu made with nigari has a nicer taste and is regarded as healthier. The nigari is also regarded as a key element to good taste. Salt from mountains in China wrapped in straw are said to be among the best. Some tofu connoisseurs say that tofu is best eaten a couple days after it is made when it loses much of its water. The ageing they say produces a rich soybean flavor and the taste is not that different from mozzarella cheese. Supermarket tofu sells for about ¥30 per 100 grams. Quality stuff---made with special beans and stone ground’sells for as much as ¥500 per 100 grams. Quality tofu made with locally-produced, organically-grown soy beans is becoming increasingly popular with the health conscious. Shima dofu is made with beans picked late in the season. The beans are raised without pesticides which mans beans eaten by worms have to be thrown out.. The beans are then rinsed in very cold spring water and ground by hand for two hours. The pulp is drained in a bamboo colander, yielding gojiu (soy milk) which is cooked, cooled and cooked several times to improve the flavor and deactivate the toxic substance found in most legumes. The secret ingredient for Shima dofu is salt derived from salt water with a unique combination of minerals collected from a single coral reef off the tiny island of Hateryma neat Ishigakjima. This salt is added to the gojiu, which is stirred with a wooden paddle and placed in four-by-ten inch cedar boxes lined with fine grain cheesecloth, covered with 10-pound lava blocks and allow to drain. Shima tofu is not cooled ordinary tofu. The town of Karatsu in on the west coast of Kyushu is famous for its zaru tofu. Produced by the chef and farmer Yoshimasa Kawashima, it has a mush-like texture and is eaten with s spoon. Much of the productions ends up in fine restaurants in Tokyo. Some is even flown to New York. One of the secrets to its tastes is using magnesium chloride as the nigari. Tofu made with it is thicker but has a milder more pleasant flavor. Calcium chloride often leaves a slight aftertaste. Gelatinous tofu is made into cakes, loaves, and candy, and is served shredded, sliced, deep fried, steamed, smoked, marinated, or fermented in a variety of foods. Favorite tofu and soy bean dishes include yudofu (tofu prepared in a sealed wooden basket and served with a teapot of soy sauce), dengaku (skewered barbecued tofu coated with miso), tofu donuts, tofu ice cream, tofu cream cakes, yuzu (tofu flavored with citrus), oboro tofu (often served cold with spicy sauce), black bean tofu, sesame tofu, coal-grilled tofu, deep fired tofu with lotus root, carrot and green peas, sweat potato with soy cream, and miso (fermented soybean paste) dumplings served on a smooth rock. In northern Japan tofu is frozen and thawed into spongy squares. A favorite tofu delicacy is yuba , a Saran-wrap-like film made from skimmed and heated soy milk that is rolled and sliced and mixed in with soup or served as an appetizer. Yuba the forms on the surface of soy milk when it is heated. After it is collected by hand it is hung to allow the soy milk to drip off. When eaten plain it has a very soft, smooth, silky texture. The lees leftover from tofu-making is said to have skin-softening and skin-toning properties and is made into a number of different soaps and cosmetics. More than 1 million tons of soybean lees is produced every year, with much of it disposed as industrial waste. 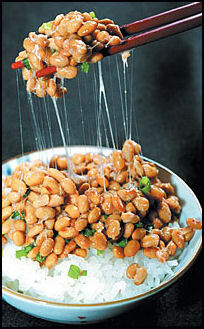 Natto is a distinctly Japanese food that is made from fermented soybeans, Many Japanese love it. Many Westerners and Japanese find smelly and repulsive. Traditionally wrapped in straw bundles, it is a sticky dish that produces lots of gooey strings if you stir it with chopsticks 50 times. Natto is sold in supermarkets in cartons of three 50-gram servings that sell for around ¥150 or ¥200. Many Japanese eat natto and rice, with a pinch of hot mustard, for breakfast and natto mixed with chopped leeks on rice for dinner. Many Japanese serve it on toast and add grated daikon, chopped okra or boiled nori later. Some people mix in miso, mayonnaise or even sugar. Others hate the smell so much they won’t go anywhere near anybody eating it. Some 20,000 types of fungi and bacteria can be used to transform soybeans into natto but only three of the more than 200 varieties of soybean are considered suitable. Natto is very nutritious. It is rich in protein, fiber, calcium, prosperous, niacin, lecithin, and the Vitamins K2, B1 and B2. It has no cholesterol and little fat but contains all eight of the essential amino acids not produced by the human body that are normally derived from meat. Natto contains an enzyme that researchers are studying as a tool to dissolving blood clots and reduce the risk of strokes and heart attacks. It also contains a substance called mucin that helps protect and repair mucous membranes and offers some relief to hay fever sufferers. Natto-like foods have been around since the Yayoi era (B.C. 200-A.D. 250) when people ate boiled beans wrapped in tree leaves. A non-sticky, buttery version of natto was introduced to Japan from China in the 8th century. According to legend, natto as we know today was accidently discovered in 1083 by military commander Hachiman Taro, who was attacked while boiling soy beans and quickly had to pack up quickly and go. After traveling for several days he opened his rations of boiled beans wrapped in straw and found the beans covered with sticky brown goo. Hunger no doubt compeled him to eat it. After eating the beans he explained, "nanto binaru mamekana! ("What great tasting beans")" and a corruption of this led to the name "natto." About 100,000 tons of soybeans are processed into natto every year. About half the beans are grown in China, 40 percent come from the United States and Canada the rest come from Japan. Ibaraki Prefecture is regarded as the main natto-producing area. About 900 companies are licensed to produce natto. Natto is produced in factories by sprinkling colorless natto bacteria liquid onto soybeans that have been pressure cooked for 40 minutes. The final product is quite smelly. .
To attract new customers, natto makers are producing natto with a less offensive smell. One company has been able to get rid of he unpleasant smell by preparing it the old fashion way by slowly simmering the beans for nine hours and wrapping the natto in bundles of straw for 50 hors. Polyglutanates---the main components of bacteria used to make natto---congeal dirt in water and are being used to clean the moat around Osaka Castle. After a popular television show and newspaper touted natto to be an ideal food for losing weight natto sold out in supermarkets. The show claimed people could easily lose weight if they ate natto everyday for breakfast and lunch. Later is was revealed that data used to support the claim was misrepresented.